Rabbits are small, furry mammals with large rear feet and short, fluffy tails. Using their powerful rear legs, rabbits hop, run in spurts, and rapidly change direction. Humans raise rabbits as pets, or for meat and fur. Domestic rabbits are descended from wild Old World, or European, rabbits. Rabbits are herbivores, or plant-eaters. Their long front teeth make it easy for them to tear tender leaves and grass. Domestic rabbits generally eat pelletized feed, along with fresh vegetables and plenty of water. Rabbits are able to get energy and nutrients from food that is low in both. Where They LiveWild rabbits live in a wide range of habitats, from arctic tundra to swamps to deserts. Domestic rabbits originally lived only in Europe but are now found wherever humans live. Around the world, rabbits adapt to the environment. In warmer climates, for example, rabbits have longer ears that keep them cool. Domestic rabbits are crepuscular, or most active at dawn and dusk. At night, they spend their time eating, drinking, and grooming themselves. During the day, they often nap. Domestic rabbits exist in nearly 50 distinct breeds. They are not in danger of extinction. Some breeds however, such as the American Chinchilla, are endangered. A number of the domestic rabbit’s wild relatives, including the Riverine rabbit of South Africa, are in danger of extinction. Number of babies per pregnancy: 5-6 avg. The Minnesota Zoo is home to a small herd of domestic rabbits. Visitors may be allowed to pet and feed rabbits in the Rabbitry with help from Zoo staff and volunteers. Visitors may also peek into nest boxes to see litters of newborns, or kits. 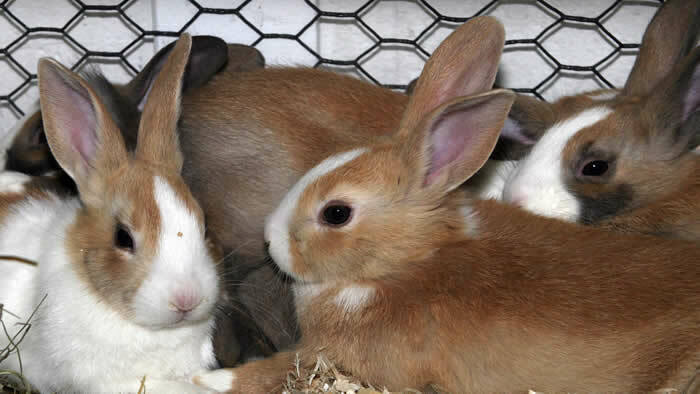 The Zoo’s domestic rabbits belong to the Holland Lop, New Zealand White and Rex breeds. Of the three, Rex rabbits are considerably larger. The Rex rabbit’s velvet-like fur is short and upright. Rabbits at the Zoo are cared for from birth. Kits (baby rabbits) are very vulnerable. Does are transferred to nest boxes inside their hutches a little less than 1 month after breeding and before giving birth, or kindling. Nest boxes are filled with soft materials, such as clean, dry hay and straw. The doe will burrow, forming a warm nest in the box. She will line the nest with fur pulled from her chest and belly. Zoo staff make sure that nest boxes stay clean, replacing soiled bedding. They ensure that kits are warm and dry. Kits are born without fur, and with their eyes closed. Unlike their hare cousins—born with fur and with eyes open—kits cannot hop shortly after birth. Kits eat feed pellets and drink water once they leave the nest box. But they will continue to nurse until they are about 8 weeks old. Weaned male and female kits are separated. Females are able to breed even before they are fully grown. Most female and male kits born at the Zoo are sold shortly after weaning. A rabbit’s ears can be like air-conditioners. Along with providing an excellent range of hearing, long rabbit ears also have a large surface area, which helps with body cooling. A rabbit’s eyes are located high on the sides of its head, giving it a wide range of vision, particularly up and to the sides. Rabbits have a blind spot, however, in the front of their faces. For this reason, humans should not offer their hands to a rabbit to sniff, as they might to a dog or cat. The order Lagomorpha consists of two families: Ochotonidae, for hamster-like animals called Pikas, and Leporidae, the family of wild and domestic rabbits and hares. Rabbits differ in important ways from hares. Rabbits are born nearly helpless—blind, deaf, and without fur. In contrast, baby hares are precocial. They are born with fur and open eyes. Hares can run and hop shortly after birth.